What do you get when you put two bounty hunters, an assassin, a space pirate and a vengeful maniac in the same space ship and have them work together as a team? You get Marvel Studios’ biggest risk so far: a riotous space adventure based on a relatively unknown comic property, with a cast as ragtag as the characters themselves. 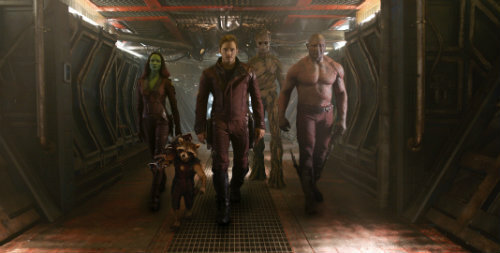 So, Guardians of the Galaxy then… did that risk pay off? In 1988, a lonely teenage boy named Peter Quill witnesses his mother’s death from cancer. Distraught, he runs out of the hospital to be alone but is suddenly abducted by a group of space pirates called The Ravagers. 26 years later, Peter is working for The Ravagers and their leader Yondu. He travels to the planet Morag to steal a seemingly innocent orb – what he doesn’t know is that the orb contains one of the Infinity Stones, and it’s the trigger for an event that will change Peter and his future forever. 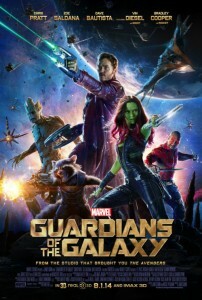 With a fanatical Kree named Ronan the Accuser and his troops chasing him, not to mention his own boss Yondu putting a bounty on his head, Peter is forced to work with an unlikely band of misfits: Ronan’s best assassin Gamora (who has betrayed Ronan for freedom), a pair of bounty hunters named Rocket (a genetically engineered raccoon) and Groot (a tree-like humanoid) and a vengeful inmate named Drax. Together, they (reluctantly) set out to save the universe – and maybe find a higher purpose in the process. Marvel’s penultimate Phase II film (the last one being next year’s Avengers: Age of Ultron) is easily the most entertaining blockbuster of the summer. A nice balance of light and dark moments, a pace that never slacks and some genuinely funny moments. Chris Pratt smashes it as Peter Quill/Star-Lord, bringing the right touches of comedy at the right time – while also sometimes completely breaking your heart. Zoe Saldana is as good as ever as assassin-gone-good Gamora, and Bradley Cooper and Vin Diesel provide the most unusual but brilliant double act as Rocket and Groot. Cooper provides a lot of the laughs, so the moments where Rocket gets introspective hit you in the feelings doubly hard. And while Diesel’s dialogue consists of basically saying the same three words over and over again (say it with me now: I AM GROOT), he manages to bring so much nuance into every instance that you know exactly what he’s getting at. The excellent main cast is backed by an equally excellent supporting cast. Lee Pace is completely unrecognisable as Ronan The Accuser, and Karen Gillan’s sassy blue psycho Nebula (this is indeed the role for which she shaved her head) needs to be given a lot more screen time in the sequel, please. In short, if you’re looking for an antidote to any kind of summer blues, this is it. Fast, bonkers, funny and glorious, Guardians of the Galaxy is Marvel’s big risk paying off big time. 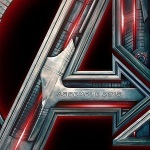 I for one can not wait until Age of Ultron hits theatres on May 1st. Bring it, Kevin Feige. I’m ready. 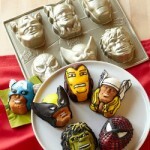 Make your own Iron Man, Thor and Captain America cakes!